WASHINGTON — President Donald Trump declassified a trove of documents related to the early days of the FBI’s Russia investigation, including a portion of a secret surveillance warrant application and former FBI Director James Comey’s text messages. Trump made the extraordinary move Monday in response to calls from his allies in Congress who say they believe the Russia investigation was tainted by anti-Trump bias within the ranks of the FBI and Justice Department. It also came as Trump continued his efforts to undermine special counsel Robert Mueller’s probe in the wake of the guilty plea of his former campaign chairman, Paul Manafort, and amid the ongoing grand jury investigation into a longtime associate, Roger Stone. In statements Monday evening, the Justice Department and the office of Director of National Intelligence Dan Coats said they are working together to comply with Trump’s order, which triggers a declassification review by various agencies “to seek to ensure the safety of America’s national security interests.” That review is now ongoing. In addition to the FISA applications pages, the president is declassifying all FBI reports documenting interviews in connection with the Page surveillance warrant as well as those documenting interviews with senior Justice Department official Bruce Ohr, who was in contact with Steele. 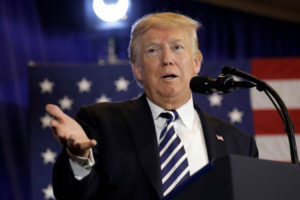 The move comes after a small group of Republicans in Congress, all staunch allies of Trump, held a news conference last week asking him to declassify the documents. Democrats criticized the effort, saying the GOP lawmakers are trying to discredit the Justice Department in an effort to protect Trump from Mueller’s investigation. Transparency wins. This is absolutely the right call from @POTUS. Schiff said the FBI and Justice Department had said releasing the documents would cross a “red line” because doing so would compromise sources and methods. Associated Press writers Mary Clare Jalonick, Eric Tucker and Deb Riechmann contributed to this report.